A large sheet gold cruciform plaque with repoussé figural scenes of the Christian miracles comprising: centre - the Resurrection with angels, Mary Theotokos and other figures; left - the miracle at the wedding of Cana in Galilee with figures and vessels of wine; above - youthful Jesus among figures in the temple; right - raising Lazarus; below - the Ascension with flanking figures. 148 grams, 23.6cm (9 1/4"). Very fine condition. This information is available to our registered clients. 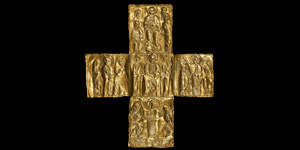 Property of a European businessman; from his private Belgian collection formed in the 1990s; previously in a North American collection formed in Illinois in the 1980s; previously with Sothebys, New York, late 1980; accompanied by the original copy of the collector's catalogue page.